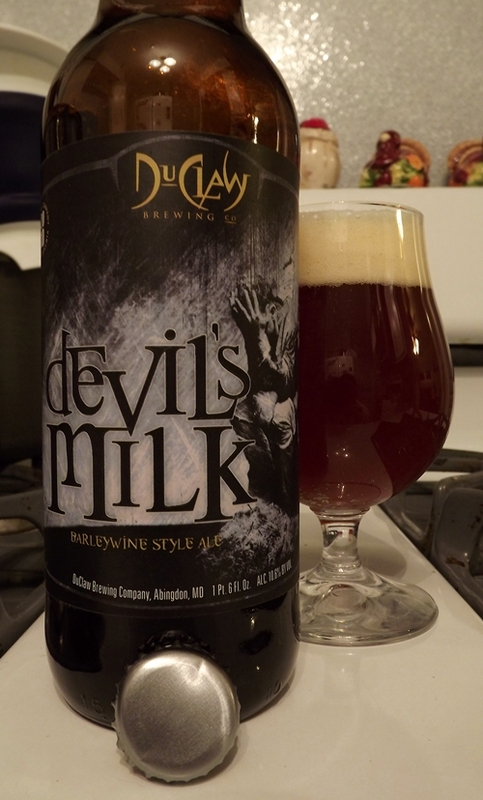 Although typical barleywines tend to be brewed with an abundant amount of malts, Maryland’s DuClaw Brewing Company flips this idea on its head and pumps Devil’s Milk full of hops. While the variety of hops change nearly each time this is brewed, DuClaw always dry-hops this beer after fermentation to make sure that you know that this isn’t your average barleywine. Pours a murky orange with streaks of crimson and brown. An active, 1.5-finger head quickly settles on top of the beer, with large, soapy bubbles slowly drifting across. Lots of static lacing sticks like glue to the sides of the glass, forming a sort of lattice pattern. The nose brings an intense amount of toffee, caramel, and hops. The hops are of particular interest to me, as they are more spicy with a touch of floral notes. The alcohol comes across strongly here as well, with a quite astringent tone to it. Wow, this beer hits fast and hard, with the malts delivering a heavy hit of sweetness. It's almost sugary in the way the front-end comes across. The toffee does its part in both curbing and aiding this in its own way, but then the bitterness starts to kick in soon thereafter. There is a slight fruitiness from the hops, but again, they add a more earthy tone with a strong bitter note, which the alcohol also help contribute to. The heat from this is no stranger, and it definitely is a limiting factor in its drinkability. Mouthfeel is moderately heavy with decent carbonation. This is fairly thick and syrupy on the palate, imparting its flavor long after you swallow. A sip goes a long way here.Drinkability is moderate. I keep going back and forth on this beer. On one hand, I love the assertiveness of this beer as it's not afraid to bring the flavor. However, I feel that these intense flavors are not congruent with each other. A strong sweetness is immediately replaced with bitterness, and then an alcohol-filled finish. It's not smooth in its transitions, and by the time you reach the aftertaste you are wishing the sweetness would return. This is around $7 a bomber, which isn't bad, and one bottle will certainly last you a while. But near the end, this may start dragging on you. Overall, I thought this had a lot of potential, but perhaps was a bit too ambitious for it to come across smoothly. This is packed with hops, sweetness and alcohol, but together they all seem to vie for the lead taste and it ends up blurring the picture and overall flavor. Last updated by Greg Bruce at March 13, 2012 . Filed under: American Barleywine, Barleywine, Beer, DuClaw Brewing Co. · Tags: American Barleywine, Devil's Milk, DuClaw Brewing Co.